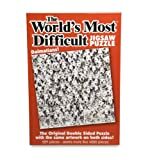 The cool new Ravensburger Krypt Silver is not your ordinary everyday jigsaw puzzle of a barn, flowers, or a little cat playing with yarn - it's brutally difficult, challenging, and possibly even fun. This sinister circle puzzle inside a rectangle puzzle by Ravensburger features 654 unique and unusual pieces that are totally blank and silver. No two pieces are alike, each has a perfect interlocking fit, and all are made from extra-thick cardboard, combined with fine, linen-structured and glare-free paper. Not only does finishing a puzzle like this feel great when you click the last piece into place, you'll be exercising your mind as well, which we all could use a little more of that lately. Good luck! 654 silver pieces - no two pieces are alike!